Report by Sophie Artemis-Pitt: HMP Send is a high security women’s training prison in Surrey. 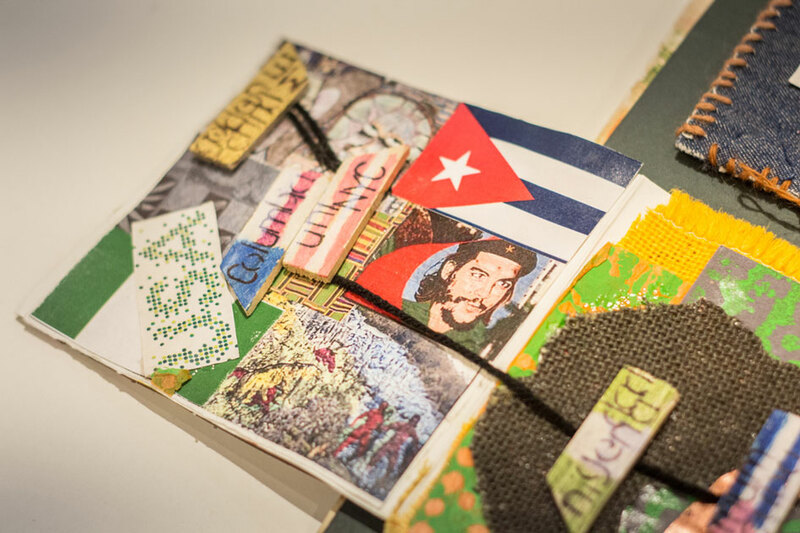 As part of Watts Gallery – Artists’ Village Big Issues project, I was asked to run a 5-week Book Art course with the focus on building new skills and developing confidence and a ‘voice’ for the eight women in the group. Each week there was an opportunity to learn a new book structure but also the scope for individuals to explore an idea through the same structure over several sessions. Due to the nature of the setting I could not use needles, instead using folding techniques in place of sewing and the use of prison supplied scissors and a guillotine for any cutting. The engagement with form and ideas by the women was very exciting and inspiring. I showed artists’ books at each session that related to either the structure or the theme that week and I talked about the relationship between form and content and how to make a book ‘read’ over a series of images or words. I have a collection of books myself, but this was added to brilliantly by the generous lending by Sarah Bodman from UWE of a selection of books that arrived in the post with this project firmly in mind. Additionally the women knew that at the end of the 5 sessions they would have their work exhibited in Bristol and they found this validating and gave them a greater sense of purpose throughout the project. One of the most remarkable moments was reading ‘Aunt Sally’s Lament’ to a silent and utterly absorbed group who clearly adored being read to. I also showed my collection of Pop Up books by David A. Carter, an amazing paper engineer which the women found inspiring. The women also loved looking at my work and wanted to know what motivated me and how I found ideas that made me want to make a book. 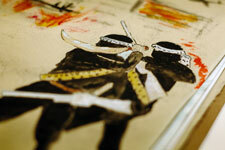 The women were very resourceful between sessions and continued to work on their pieces in their cells. 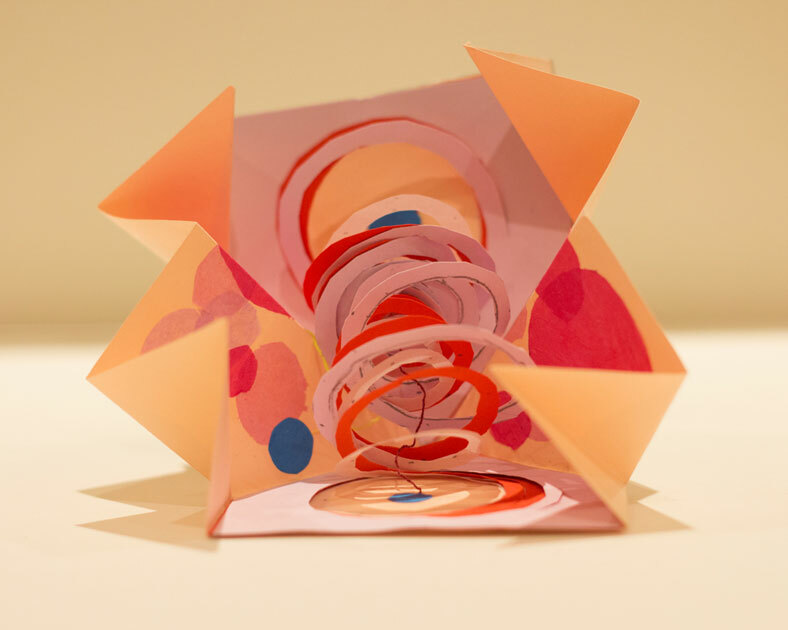 Ann began with a piece called ‘Spillage’ but her ideas really blossomed when she worked on ‘Tumour’ a Turkish Fold book using paper engineering to make spirals that rose and joined, held together by a thread when the pages were opened. ‘Realisation’ is a jewel-like painted telescopic book where as you turn the final page you encounter an unsettling eye looking back at you. Sam’s Telescopic book married her love of Female Pin Ups, tattoo art and Manga with a journey into seduction and tragedy. Jenny’s concertina book ‘Tear Drop (frozen)’ tumbles open and downwards like cascading tears revealing a poem about thwarted love. Leonora’s Autobiography is a giant book housing tiny books, each one relating to a stage in her life from her birth in the United States to her move to the UK as a woman of colour and all that followed. Sue’s Codex book reflects on the Syrian Refugee crisis and journeys with the refugees as they flee Syria in search of a better life. 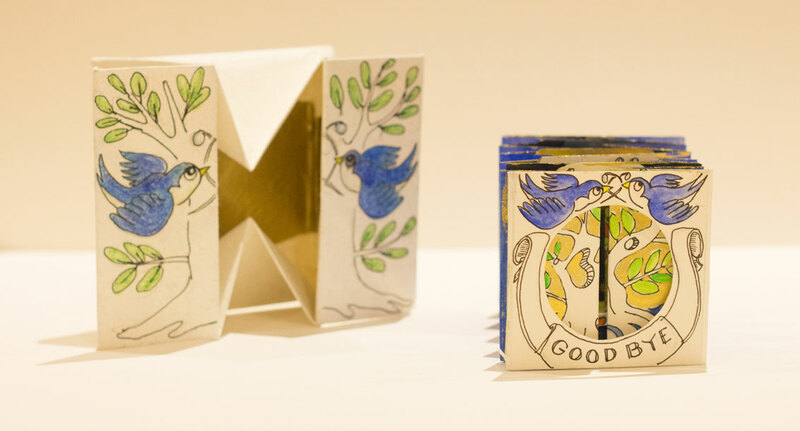 Akila’s two companion pieces Turkish fold books ‘Zest’ and ‘Stirrings’ open to A2 pages with sweeps of horizontal colour and gold like an ocean or landscape, wide open freedom on a page, folded into a square of gold and a square of silver. Amanda’s delicate and tentative watercolour landscape folds up into itself. 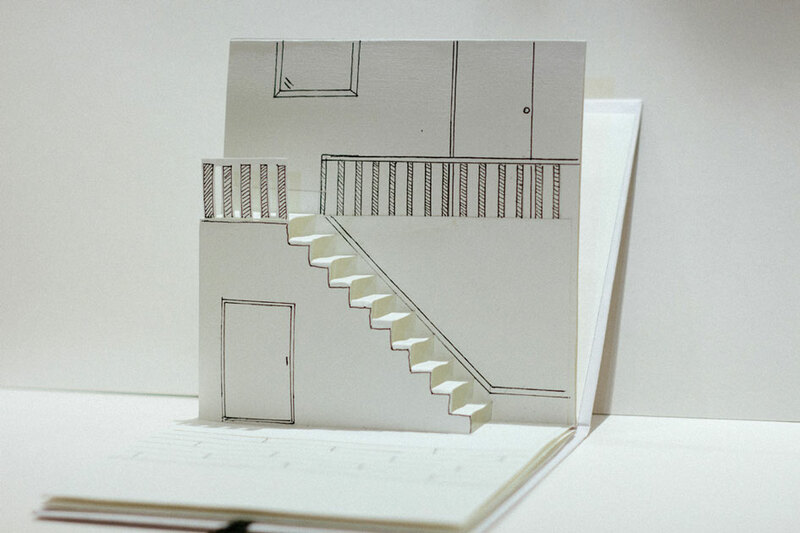 Dena’s Pop-Up book ‘Brick’ shows the interior of a house, room by room and is a moving reflection on building a house that is not just a physical place, but a place of dreams, hope and of strength, love, space, freedom, self-esteem and moving forwards. 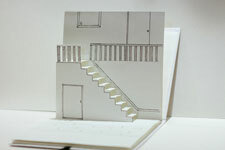 The pop-up structures have a precision and function, but the house being a black outline on white makes for a ghostly, dream like blank canvas feel: it is a plan. Dena’s concertina codex, butterfly book ‘Captured Beauty’ shows doors opening onto pitch black that increases in size as the book progresses until the final door opens to free a black and white butterfly. The tension and sense of being trapped finds release in the final door opening. ‘Landscape’ is concertinaed into a brown paper parcel of a cover, claustrophobic, moving from the open seas to the dark cliffs; sepia in tone like a parcelled away memory ‘Opened to form the beauty of the landscape’ in Dena’s words. In a small, black paged book, the white letters that spell out the word ‘Hope’ shine from each page. Jenny is showing ‘Tear Drop (frozen)’ a concertina book with a tear-drop shaped cover and a cut out interwoven concertina centre giving the sense of the page being a flowing river of tears. The pale blue and silvery pages house a love poem which ends ‘Words don’t mean a thing, Actions are Everything’. I found these sessions immensely rewarding. Found the progress amazing and inspiring and the relationships between the women and their work and myself utterly engaging. I am so pleased that the work is going to be exhibited and that I had this opportunity to work in HMP Send where the women created these darkly beautiful books. Watts Gallery – Artists’ Village is a unique 19th and early 20th century art heritage site located in Compton, Surrey. First opening its doors to the public in 1904, the Watts Gallery is a purpose-built art gallery created for the display of works by the Victorian artist George Frederic Watts OM RA (1817-1904). 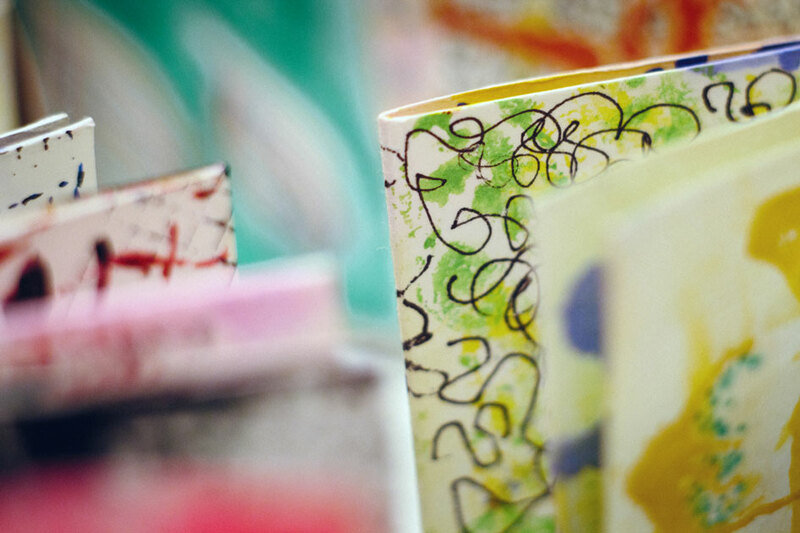 Founded in 2008, the Big Issues project offers artist-led art, craft and design workshops to vulnerable and socially excluded people in the local community. 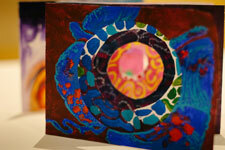 The workshops help participants to build confidence and learn transferable skills through creating art. Participants work towards creating finished pieces inspired by the heritage and collection of Watts Gallery – Artists’ Village. The artwork is then displayed in an annual exhibition at the Artists’ Village in which participants are given the opportunity to sell their work. The Big Issues project stems from the ‘art for all’ ethos of the Gallery’s founders, G F Watts and his wife Mary Watts. They cared deeply about a number of social, cultural and environmental issues that are still extremely pertinent in the present day. These concerns are reflected in G F Watts’ work, in philanthropic projects he and his wife supported and in public and community art projects they founded. At the heart of their work was the belief that art could transform lives, and they campaigned to widen access to art for people in society with least access to it. 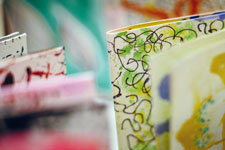 The Artist in Residence programme at HMP Send, a closed female training prison in Surrey, is now in its seventh year. In 2015, the programme has seen various visiting artists teach skills in book art, painting, ceramics, greeting card design, and drawing. Watts Gallery – Artists’ Village is extremely grateful to Sarah Bodman and the University of West England for their interest in the Big Issues project and for displaying the work produced during the five book art workshops led by Sophie Artemis Pitt. As is evidenced in the works of art on display, the group of eight women took to bookmaking immediately, and were quick to acquire new skills and realise the unique creative potential of this art form.